LONDON, UK / ACCESSWIRE / March 4, 2019 / WATTY, an IT company led by Gleb Braverman and Vlad Vodolazov, presents WATTY Multiuser AR technology, the one making "Kingsman" and "Star Wars" augmented reality meetings much, much closer. WATTY tech allows a virtually infinite number of users to share the same AR experience, not sharing the common "real world" surface. AR can now be displayed by people thousands of kilometres apart: whether it be an AR game, online lecture, remote surgery demonstration, engineering stuff training, in-city open world AR, or an influencer solving daily AR brain-teaser sharing stories with the followers, WATTY Multiuser AR will help users get those live and seamlessly. WATTY releases its Dance Battle pilot multiplayer game to demonstrate the multiuser AR technology. Starting off with the cross-play iOS/Android-compatible alpha version, WATTY Dance Battle users will be able to dance-challenge their friends or celebrities online, making music videos and sharing them across social media. Players will use their unique avatars, styled and clothed to fit the personality. 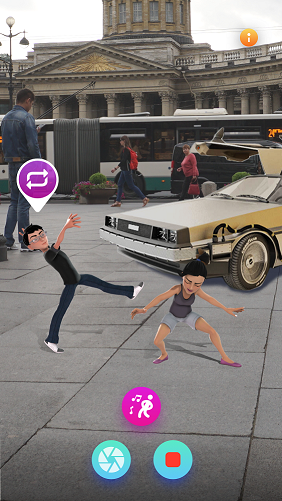 Shareable dancing battles with friends and celebs is the key game feature. Not only can one dance with buddies, but get access to online dancing with famous people - movie stars, musicians, politicians, and influencers. "The technology behind WATTY Dance Battle is yet to reveal its potential. Not only we see WATTY Remote driving the AR gaming industry revolution. Unlike the newly released $3,500 Microsoft Hololens claiming to support the remote collaboration mode designed for corporate use only, WATTY use-cases include EdTech, HealthTech, AR conferences, social network and corporate plugins, streaming and live video enhancement, dating apps, trainings, lectures and numerous manufacturing applications. WATTY Multiuser complements multiple industries by addressing the fundamental issue of remote AR experience accessibility." WATTY will release an alpha-version of the Dance Battle AR game as soon as early March, with the operable viral beta available mid-April.